The Gadget: Gomadic's QuadCharge Universal Charging Station, which charges your phones, MP3 players, Bluetooth headsets and various USB devices all in one place. It saves space, plus organizes cables neatly with only one cord running out into the wall. The Verdict: Sturdy build (slip-proof surface) and lots of charging tips allows you not to have to sacrifice quality for convenience. Oh, and it's reasonably priced too, which makes this a definite buy if you've got multiple gadgets to charge. You still have to buy individual charging tips, which are sold separately. It's also somewhat bulky, but considering that it's four chargers in one, it's quite reasonable. The Performance: It charged our phones and MP3 players in just about the same time as it would take with a standard charger. Most devices fit neatly onto the slip-proof tray, but large devices such as Nintendo DS Lite may require some arrangement. The Price: $49.95 for the base unit, $5.95 for each charger tip. 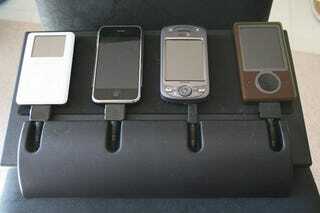 The Recommendation: If you have a lot of stuff to charge (phones, MP3 players, DS Lite, whatever), get one of these. At $49 + $24 (for four tips), you'll save lots of space and have a nice station for all your electronics to boot. It doesn't charge quite as many devices at once as the Chargepod charge station, but each tip only costs $5.95 instead of $9.95.